Church pews are strong, durable and designed to last forever. Although, to maintain beautiful church pews some minor repairs may be necessary from time to time. Most repairs can be accomplished by anyone with basic woodworking skills. The most common type of used church pews repair is for splint supports. Pew supports are the legs of the pew that are located in between the ends. A majority of pew manufacturers will space their intermediate supports no more than 5-feet apart. Having additional supports placed closer together allows the seat and back to hold up better over a longer period of time. Over time, the glue joints on these supports can separate or split. When this occurs, repairs are necessary. 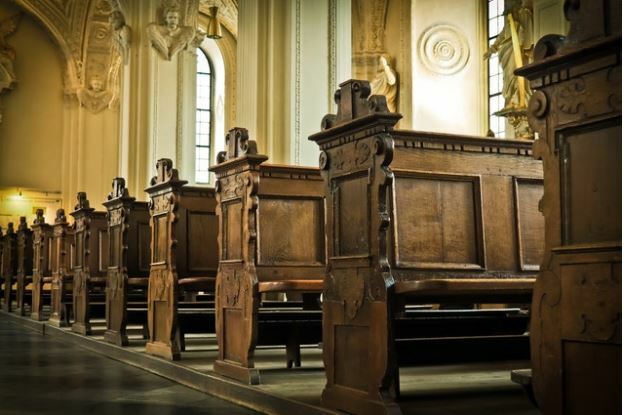 Here are a few basic steps to quickly repair a broken support and prolong the life of your pew. Start by removing the support from the bottom of the pew. In most cases, there are going to be two or three screws located behind buttons on the back of the support. There generally are going to be a few more underneath from the support to the seat of the pew. Be sure to save your screws to put them back in when you are done. Once you have the support piece free from the pew, it is easy to see the problem. Start by brushing a generous amount of wood glue on both sides of the split. Line up the two pieces and push them together, using a bar lamp across the span close to the top and tighten it shut. If you are worried about causing damage to your support, place a piece of fabric or another object between your clamp and support to protect the wood. Once you have the first clamp in place, place another one at the bottom. Tighten the clamp at the bottom all the way, then try to tighten the top clamp a little bit more. When squished together, the glue will squire out the side. Let the glue run down the sides and puddle at the bottom. Once the glue dries and hardens, you can easily scrape it loose with a razor blade or your fingernail. Let the wood glue dry for a minimum of three hours or overnight. Remove the clamps from the supports and scrape off the excess glue. Replace the support on the pew. Replace the screws in the support, followed by the buttons covering the screws. Now that you are done, you can move onto the other supports on your used church pews. A little bit of maintenance can help to prolong the life of your pews for years to come. If you find that your pews are beyond repair, you can invest in new or used pews from Born Again Pews!